Colors greatly impact how customers see your brand. However, color theory and how it makes us feel is oftentimes hard to pin down to specifics. Some colors have different cultural associations that warp their meaning. Every person is unique in how colors affect him or her, but there are some commonalities we can examine to give basic ideas on how to start using color branding. White is one of the neutral colors, so it can work well with just about anything. It’s used in the medical field, so it’s associated with cleanliness and hygiene. Use white in your branding to make other colors stand out. White is associated with openness and a willingness to help. Mysterious and elegant, black is often used to show power in branding. Like white, it works well with most colors. In some cases it can be hard on the eyes, so make sure you pair it with something easy to see instead of another dark color. Black works well in modern designs. However, be careful with black; it has associations with gloom and death as well. Grays are often used in place of black colors for a softer look. The color gray is a safe one to use in branding. Use it if you want to evoke feelings of security, stability, or dignity in your customers. You will need to lighten it up some with other colors, though, since it comes off as boring when standing alone. The color brown is earthy and warm. It works well to convey a sense of welcoming and calm. Much like gray, however, it should be kept as a background color. Browns carry associations of wood, stone, and soil. A brown can be lightened or diluted to beige to achieve a modern, elegant style. Red is the color of power. It is a bright, energetic color that represents leadership and activity. It stands out in a logo or banner so make sure it doesn’t clash with other strong colors around it. However, red also represents violence and has associations with blood and control, so keep that in mind when using it for your branding. Yellow is a happy, cheerful color. It doesn’t offend and is associated with bright sunny days and warm greetings. Yellow doesn’t show up very well against other light colors, so make sure there is enough of a contrast with the colors around it. Orange is much like yellow in association. It represents cheer and enthusiasm, but has more of a bite to it than yellow. Muted orange looks like a happy brown color and can be used as almost a neutral in that respect. Orange has a similar power to the color red, but is less forceful about it. Blue is calming and cool. It’s reminiscent of the ocean and the sky, so it has nature associations. It is seen as friendly, secure, trustworthy and stable. Bright blues can be energetic while light blues are relaxed. Blue can also be seen as sadness. Green is a lively color used to symbolize growth and freshness. It has obvious associations with nature and springtime. Use it as a healing, calming color. It should also be noted that green is the color of money, which is often considered in branding designs. Purple has long been considered a color of esteem or class. It’s rich and strong when used in full saturation. Toning it down creates spring like tones that are associated with youth. Colors can make a big difference in your branding efforts. They alter the moods and feelings of your customers, so it’s important to make these associations positive. 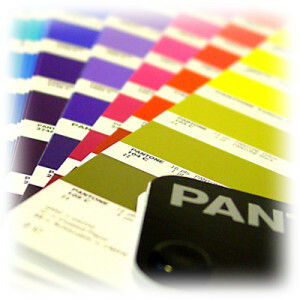 Use color branding in simple ways to leave lasting impressions in the minds of your customers. If you need any help with branding your business, don’t hesitate to contact us. At Electro Image LLC, we provide graphic design and commercial printing services producing popular items such as brochures, banners, catalogs, logos, business cards, postcards and direct mailing that will make your brand stand out and leave a lasting impression.